Without any doubt, Casino, released in 1995, still refers to the best casino movies of the whole cinematograph history. Starring the best actors, this movie attracted attention not only of gambling admirers only, but also of movie lovers. Martin Scorsese is probably used to approval of critics and viewers. Five years before he has succeeded in releasing another gambling criminal story that has contained almost the same main characters - GoodFellas. This movie appeared on screens in 1990, and even now it is known as one of the best criminal movies. This movie is based on Wiseguy: Life in a Mafia Family novel. Thus, these two (GoodFellas and Casino) are frequently compared by critics. 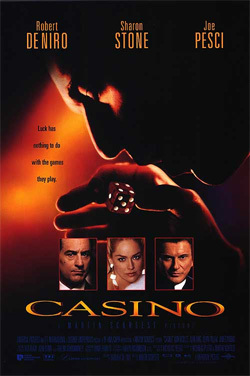 Casino was extremely popular not only due to director`s professionalism but to perfect acting of Robert De Niro, Joe Pesci and Sharon Stone that reflected all characters excellently. Casino film is called the last really great movie starring De Niro. He has showed his fabulous skills and organically got into the role of his character. First of all, it is a movie about very interesting period of the US history - a sunset of old Las Vegas, the mafia-controlled city, which was built on dirty money and was completely owned by Italian 'godfathers'. Then it changed into new Vegas, and FBI did their best to clean the city from criminal world. A lot of old casinos were pulled down and in their place the new gambling establishments have appeared. Since the boom of the online casino industry, people from all over the world can play their favourite games at sites are just like casinos that they thought were only possible to visit in the movies. It’s as if James Bond’s personal casino has just landed in your living room. So, United States of America, Las Vegas, the seventies. Every police station, labor union and every legislative officer is controlled by the whole families of mafia. The fictitious persons or front men become formal owners of casinos, while the virtual masters are real professionals, advanced by criminal organization, who know exactly how to arrange a casino for the better profit. Martin Scorsese has worked thoroughly to present the colouring of that time and the gambling situation of Las Vegas via two picturesque figures. The gambling business professional - Sam 'Ace' Rothstein is the chief of the Vegas Tangiers casino and hotel appointed by the most influential members of mafia. Nicky Santoro is a gangster that is responsible for Ace`s protection. During the film viewers can oversee their ups and downs and the complicated circumstances that make two friends to become bitterest enemies. Sam falls in love with a prostitute Ginger McKenna and marries her. However, their marriage doesn`t contain reciprocal feelings and looks quite tragic. The movie represents the historical report of those days. Moreover, it was filmed from novel of Nicholas Pileggi, based on real events. The book was written accordingly to records of judicial proceeding on criminals in Kansas-city. The film has gained an innumerable quantity of awards, such as Golden Globe and Academy Award and has been met with an absolute approval.